There can be no successful business presence without a strong digital presence. Since the digital revolution, customers, partners and providers have transformed their online presence into a new realm for transactions and business matters. A company that has no website is not taken seriously by the public, nowadays. But does it mean that modern businesses can be entirely digital without an IRL – in real life, aka physical and tangible – existence? If you’re an enthusiastic digital entrepreneur, it’s time to step out away from the world wide web and discover the impact of your offline presence. Successful businesses combine online and offline for a reason: You need both to grow! Why do you need an IRL presence? When the world enables virtual and remote communication, it can seem strange to think that face-to-face communication could still be valuable. There is no denying that companies have saved a lot of money and time by reducing the need for face-to-face meetings through video conferences with their clients and partners. Indeed, virtual meetings provide the flexibility and agility you need in modern interactions. Collaboration is only one click away. So why do we continue to promote offline meetings and meetups? As surprising as it might sound, the concern comes from the younger generation, Generation Z, who believe it’s important to meet people face-to-face if you work with them. In other words, while virtual tools bring a necessary flexibility, it would be foolish to assume that human communication has no value. Getting to know people at a personal level is key when working in a team, so that you can develop a trust relationship. Additionally, there are industry sectors that can’t survive in the online sphere, from car dealerships to real estate; there are items you can’t just buy online without seeing. At a business level, you can easily combine online and offline content to ensure a smooth transition. For instance, all it takes is to share your social media profiles offline, such as by printing it out on the menu of your restaurant or a sign at the trade show. Not only do you remind customers where your online content comes from but you can also encourage users to share their offline experience of your business through pictures and comments. For bloggers and content creators, the opportunity to print out material like a book or a handout for conferences can also make a great deal of difference. Ultimately bringing your existing content offline is the secret to maintaining a balance. Customers expect to be able to get in touch with a company. That’s precisely why successful companies provide more than one option for users to contact them. Aside from the typical contact form and social media accounts, users want to see a postal address and a phone number. 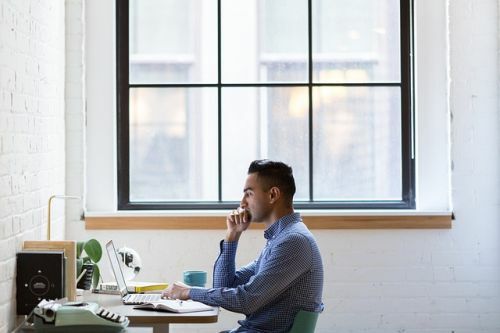 However, when you are a solo entrepreneur working from home, the idea of sharing your personal address can be a little daunting, to say the least. But you can thankfully use alternative solutions, such as using a virtual PO box or mail forwarding services from https://physicaladdress.com, if you want to protect your privacy. For small companies, while the physical address may not be an issue, phone calls can be difficult to manage in a limited team. Here too there is a way around the problem, as you can partner with a call center to provide customer services on your behalf. From a customer’s perspective, it means that can talk to a real person to obtain immediate answers. If you’ve been growing your LinkedIn network successfully, you might be surprised to learn that you also need to network in the real world. In fact, a lot of young adults are not comfortable with networking events and can even be shy when they meet their peers. That’s precisely for them that https://www.cio.com published a few networking tips. Networking is about building positive relationships based on mutual generosity. You can’t grow your business with these, and you can’t trust people you have never met. What happens to online-only businesses? As more and more customers experience online frauds, from unsecured websites or even websites that pass as businesses, it’s fair to say that when a company doesn’t manage its offline presence, users can get suspicious. The main worry that pops in the mind of the customers when discovering a business that only operates and exists online is as simple as that: Are you even real? In conclusion, while no business can grow with an online presence, it’s absolutely crucial to understand that your online presence is no replacement for an IRL existence. As a business, you need to learn to combine online and offline elements to survive on the market.